Traveling the Pennsylvania Turnpike (Interstate Highway 76) can be an interesting experience. Depending on the time of year “Penns Woods” turns its colors from the steel gray of winter to the green of summer to the brilliant contrasts of autumn. All of this is contextually enhanced by the physical nature of mountains, ridges and valleys. The present day routes of concrete, macadam and steel now replace Indian paths and the old Forbes Road that also crossed southern Pennsylvania centuries ago. Bedford County, the featured county in this week’s blog is the halfway point along the Turnpike between Harrisburg and Pittsburgh. 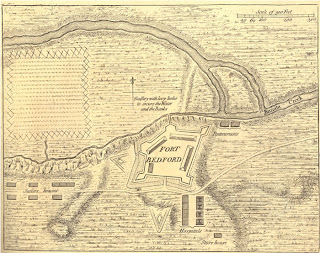 Historically, it is perhaps best known as the location of Fort Bedford, an important 18th century French and Indian War Period military fort built and garrisoned by British troops under the command of Colonel Henry Bouquet. 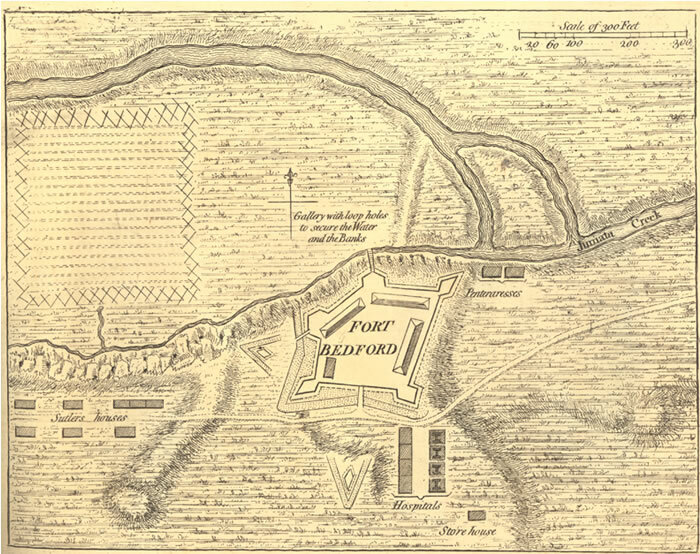 Although the footprint of Fort Bedford has not been traced archaeologically, historical documents and detailed journals suggest the fort site is near the Fort Bedford Museum on Bedford’s north side. The fort itself, a 21,000 square foot pentagon- shaped structure of chinked logs with a pentagon-shaped bastion at each corner supported swivel cannons. The stockade had three gates and elevated V-shaped redoubts on two sides for added defense. The fort that overlooked the Juniata’s Raystown Branch was of classic military design and typical of the period when British forts were being built on the early American frontier. A short distance from Fort Bedford is Old Bedford Village an open air, living history theme park where educational and entertainment activities are held seasonally for the general public. 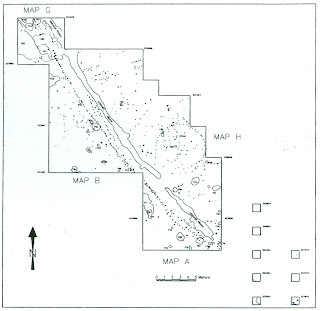 During the 1970’s a large Late Prehistoric village site (36BD90) was discovered on the property when underground water lines were installed during the early stages of construction. 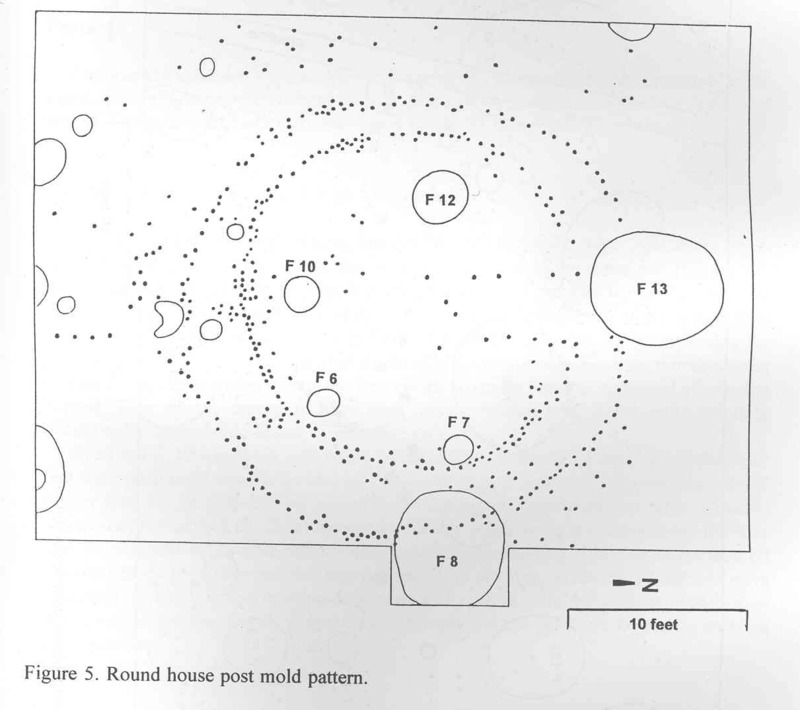 By agreement with the land owners, Juniata College and Penn State University conducted field investigations on certain areas of the site that revealed post-molds associated with a palisade wall and ditch; several circular-shaped houses and numerous pit features. The artifact assemblage from the site consisted of stone triangular points and shell and grit tempered pottery, all types linked to the Late Prehistoric period (AD 1050-1550). 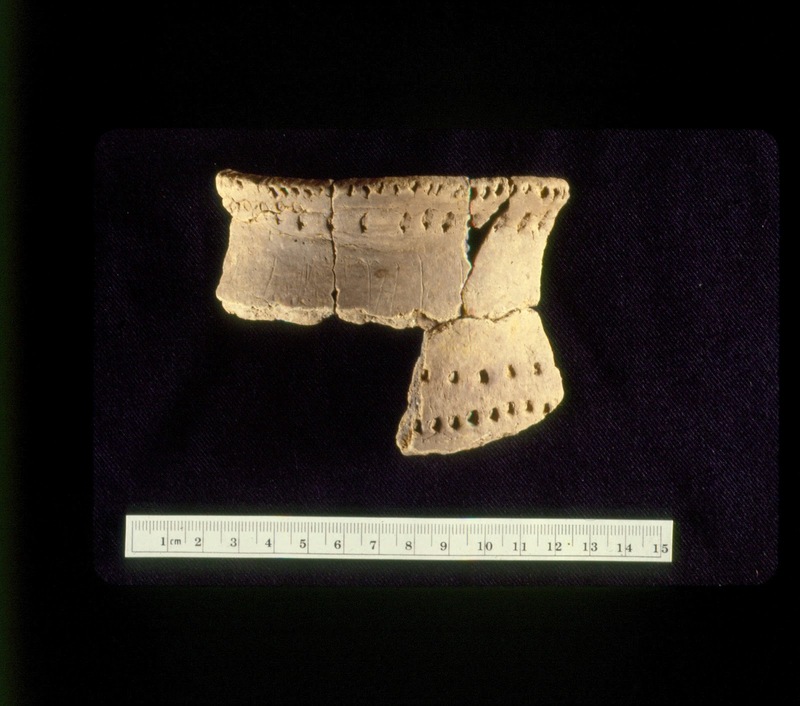 More specifically, the shell tempered pottery with its S-twisted cord impressed surfaces were of the sort that archaeologists normally identify with the Keyser Culture of the Potomac Valley. The pooled age of radiocarbon dates obtained from two separate wood charcoal samples place the age of the Keyser village occupation at Old Bedford Village at AD 1025. 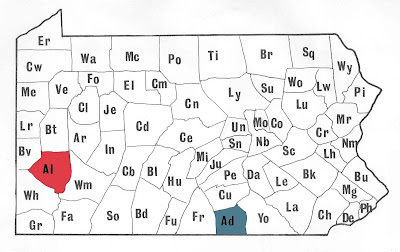 Discovery of a Keyser village in Bedford County was quite exciting and extends the range of known Keyser occupations into the Upper Juniata drainage, a region that traditionally was the territory of the Clemson Island culture at that time. A number of other Keyser Culture occupations have since been identified in the Potomac’s Conococheague and Antietam drainages of Franklin and Adams counties, however, they appear to date several centuries later in time than the 36BD90 occupation. 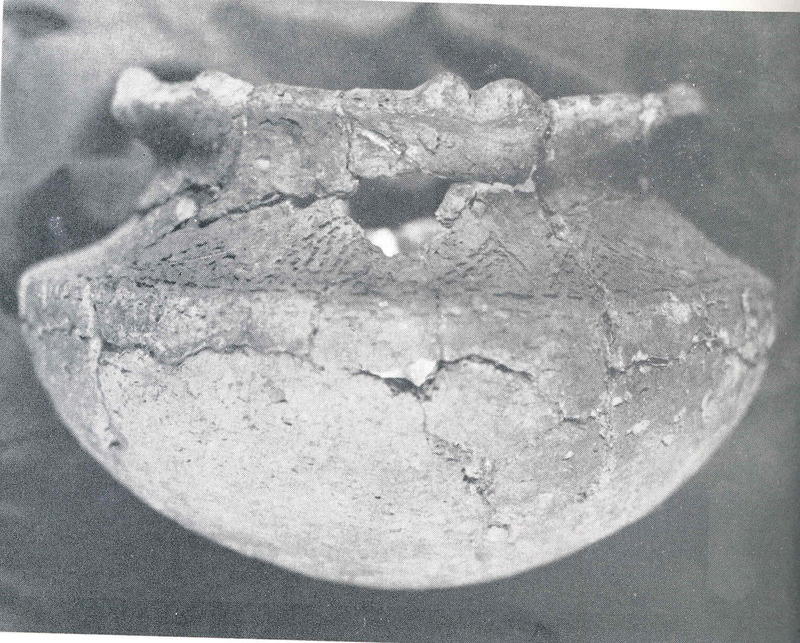 Further afield, in the counties of York and Lancaster, Keyser pottery has been linked with 15th century Shenks Ferry Tradition village occupations and suggests that Keyser people interacted with outside groups on a level of interaction that was perhaps focused on the exchange of goods and/or the exchange of mates, economic and social strategy that served to strengthen alliances between the two cultures. Another site was excavated by Penn State University and Juniata College in 1967 as a joint field school. 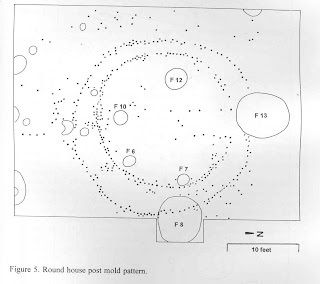 The Workman Site (36Bd36) was a multi-component site predominately Late Woodland with post molds and pit features suggesting multiple house patterns. Variation in house patterns and pottery types suggest influence from the Susquehanna and Potomac Valley implying repeated reuse of the site. 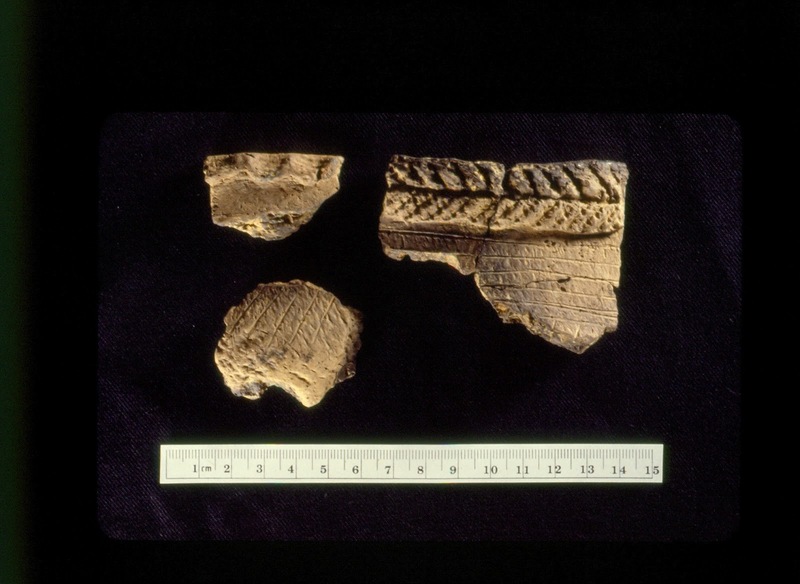 Pottery recovered from the excavation included Clemson’s Island and Montgomery/Page wares indicative of the earlier part of the Late Woodland approximately 900-1200 A.D. Turning to Environmental Review and Compliance projects for Bedford County, to date there are eleven collections that have been placed in the permanent collection. The collections include prehistoric and historic period objects from archaeological investigations. Site documentation and other collection records that have been accessioned under State and Federal mandates can be accessed by arrangement with the Section of Archaeology, The State Museum of Pennsylvania. 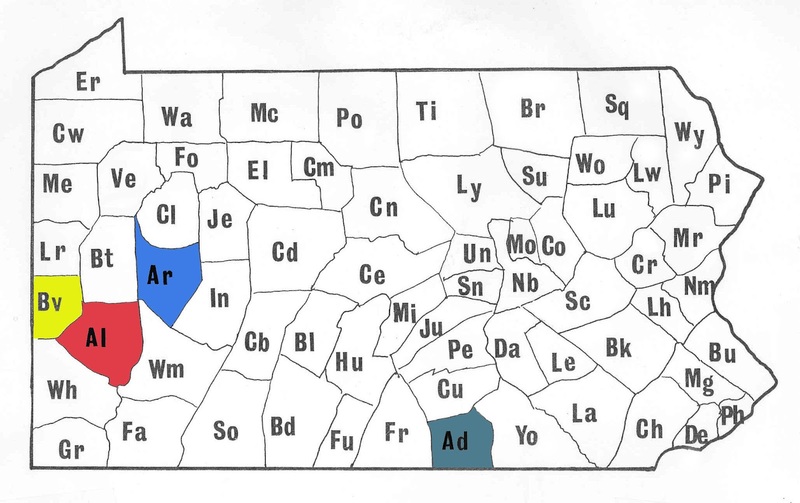 Continuing with our archaeological tour by county, we stay in western Pennsylvania and visit Beaver County this week. Located on the border of Pennsylvania, Ohio and West Virginia, a stream by this name runs through the county before entering the larger Ohio River. French traders translated the Delaware name Amockwi as Beaver stream or river, so named for the abundance of beaver in the area. Research of historic documentation identified four 18th century Native American villages in Beaver County, generally in the area of these adjoining streams. These streams play an important role in the settlement of Beaver County and it comes as no surprise that seventy percent of the archaeological sites recorded here are from riverine settings. The fertile soils found along these river bottoms supported the lifeways of Native peoples in this region as early as the Archaic period 10,000 to 4,300 years ago. The Ohioview site, 36BV9, is a stratified site located on the banks of the Ohio River in central Beaver County not far from the town of Ohioview. It is a site with multiple prehistoric occupations along the river’s terrace for more than a mile. In the mid-1950’s features and artifacts were found eroding from the site when part of the river’s bank eroded out as a result of flooding. An earnest salvage operation commencing in 1955, was undertaken by members of the Amockwi Chapter, Society for Pennsylvania Archaeology (Alam 1961). Thus began a long and deeply committed study by the Amockwi Chapter that, over the years, revealed some of the site’s interesting past. 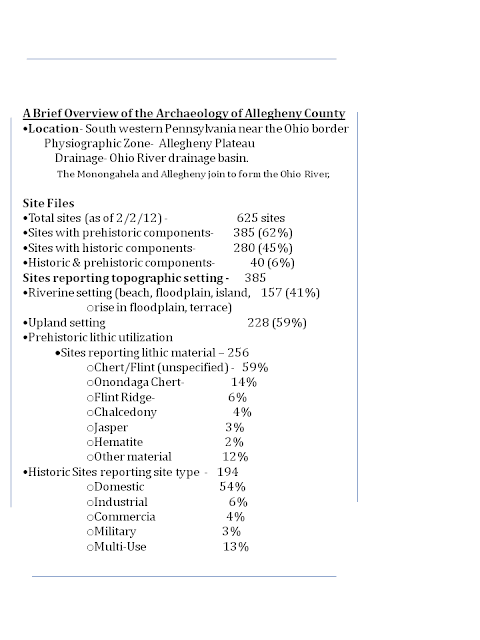 The Ohioview site proved to be a well stratified archaeological site. In the upper-most stratum (12-24 inches) the Chapter members found a Late Prehistoric Monongahela village that they identified by a partial palisade line and a number of circular-shaped hut structures. Indications of other huts were uncovered outside the palisade line hinting that multiple Monongahela occupations were present. Refuse filled features contained diagnostic points, shell tempered pottery, animal bone and the shells of river mussels. Other debris including stone hammers, stones with pitted surfaces and quantities of flint chipping debris were found around hearth stains. Chipped Stone tools from 36Bv9, Ohioview site. Fragments of an earlier pottery type tempered with crushed limestone was also present in the upper-most stratum which archaeologists have identified as Watson ware, a Late Woodland pottery variety common to this section of the Ohio Valley. At a depth of 24-36” stratum pit features contained river pebbles and limestone fragments along with ground and pecked stone tools, choppers, a chisel and rubbed hematite. Watson ware vessel fragment, note the open "pock" of the clay an indicator of limestone tempered pottery. From 36-48” the deposits at the Ohioview site contained differentially sized fire pits, having little more in them than fire altered rock and charcoal suggesting perhaps a function of drying or roasting food. In general, the deeper levels of the site are attributed to the Middle and Early Woodland periods. Mahoning and Half-Moon wares of these periods were found in abundance thereby demonstrating their importance as utilitarian wares at the site. Other diagnostic artifacts associated with this stratum included Forest Notched (a type of fishtail-like point) and sandstone bowl fragments, a counterpart to steatite bowls found in the eastern regions of Pennsylvania. Recurring flood episodes deposited a sand/silt level of 12-14 inches which covered most of the site helping to preserve these early occupation levels. Through the efforts of the chapter members the recovery and analysis of this important site has provided archaeologists a window into settlement patterns on flood plains. Moving into the historic period we travel to Ambridge, just a short distance from Ohioview to another settlement on the river’s edge, Old Economy Village. The formal gardens created by George Rapp as early as 1824 were planned in four sections. These sections consisted of vineyards, a Grotto (a stone structure for meditation and retreat), fruit trees, flower beds and the central area for a pond and pavilion with fountain. Influenced by German traditions and religious imagery the gardens were viewed as an expression of both social and economic position by visitors to Old Economy. Archaeologists from Heberling Associates recovered the original pattern of planting for the vineyards. Post mold stains aided in the interpretation of the original pattern for planting the vineyards. Recent archaeological investigations combined with extensive research of historic documentation have provided this historic site with valuable information for restoration of the garden. Archaeologists were able to identify planting methods for vineyards, concentric planting patterns for the gardens as well as historic paths. A brick lined root cellar located within the foundation of a shed/cow barn produced fragments of dishes and glassware which provide examples of tablewares previously used by the Harmonists. This brick lined root cellar produced fragments of tableware. The archaeology conducted at these sites was for two distinctly different reasons, but through careful excavation, recording and preservation archaeologists were able to answer questions about past human activities. In the case of Ohioview the excavations were necessitated due to the washing out of important archaeological features from repeated flooding. For Old Economy the archaeology was conducted to provide information important for the accurate historic representation of the landscape to visitors of this communal settlement. We hope you found this tour of Beaver county archaeology interesting and that you will continue to visit us as we travel across all sixty-seven counties. Awareness of our archaeological heritage is an important step in Preserving the Past for the Future. (1961) Alam, Emil. 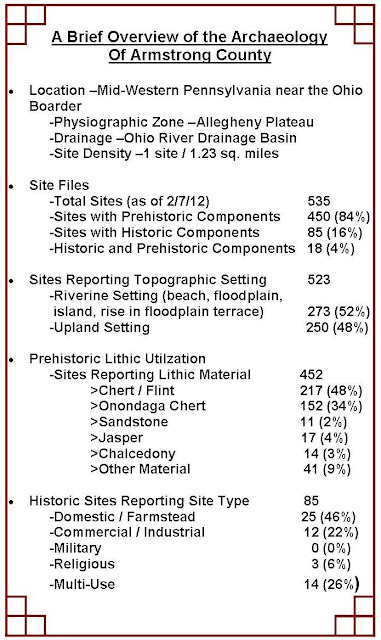 A Preliminary Report on a Stratified Site at Ohioview, Pa. Pennsylvania Archaeologist 31(2):61-77. This week we travel up the river from Allegheny County to Armstrong County. This County is located on the edge of the Unglaciated Appalachian Plateau and is drained by the Allegheny River, Crooked Creek and Redbank Creek. 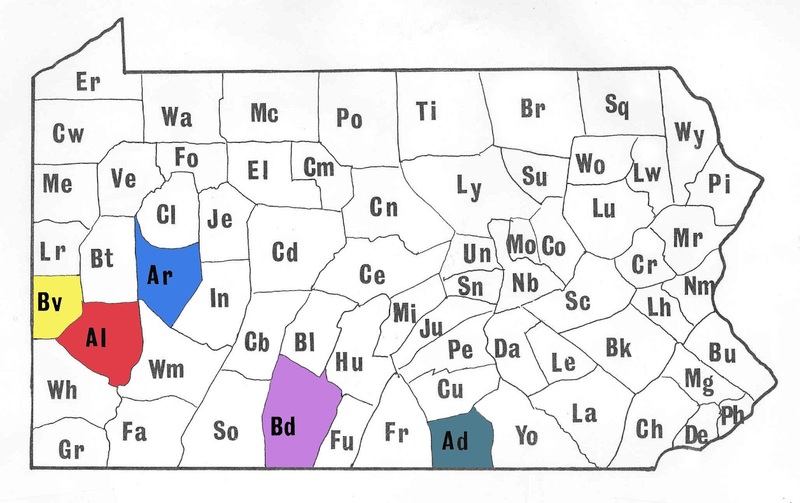 There are 535 sites recorded in the Pennsylvania Archaeological Site Survey files and they include sites from Paleoindian through the 19th century. It is a rural county and over 87% of the sites have a prehistoric component. The Brown Site (36Ar188) reported by George and Davis (Pennsylvania Archaeologist 1986 56(1-2)12-20) is one of the few stratified Early and Middle Archaic stratified floodplain sites in the Allegheny valley. The historic sites are mostly 19th century but the Woodward domestic site (36Ar469) dates to the early 18th century. The prehistoric sites include several Late Woodland villages, 62 rockshelters and two petroglyphs. 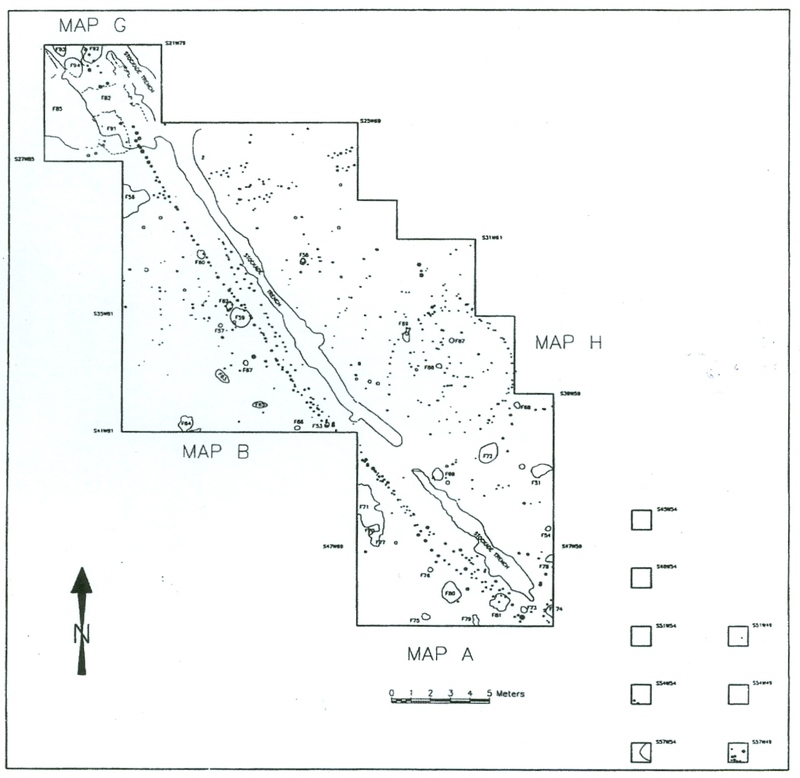 The Wadding Rockshelter site (36Ar21), reported by George and Bassinger (Pennsylvania Archaeologist 1975 45(4)1-21), was another stratified site that was important in determining the cultural sequence in the region. The Late Woodland period in the Upper Ohio Valley is best known for its Monongahela villages. These occupations usually consist of a ring of round houses frequently surrounding an open plaza. They are usually stockaded and are defined by Monongahela pottery types. However, the Late Woodland period in the middle Allegheny valley is different. Research in Armstrong County has been critical in identifying this new phases of the Late Woodland period for western Pennsylvania. 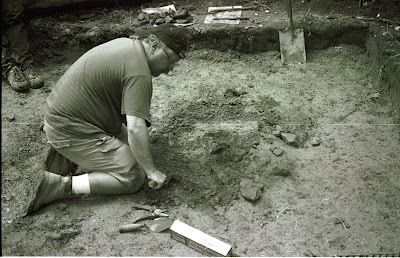 The major excavation in the county was conducted by Kenneth Burkett (Field Associate, Carnegie Museum) at the Fishbasket site (36Ar134) along Redbank creek on the border with Clarion County. 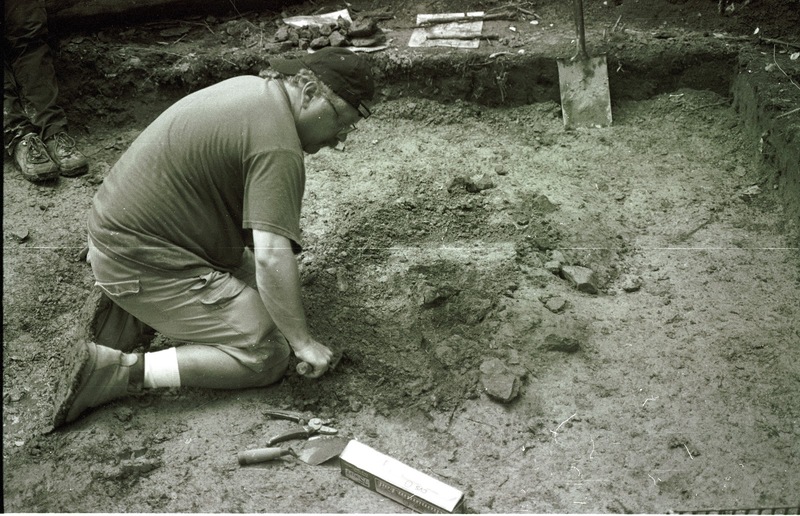 Ken also excavated the Fishbasket North site (36Cl91) located directly across the creek in Clarion County. Both of these sites were multiyear projects. Ken, his wife Cheryl and a group of loyal volunteers excavated these sites by hand, without the benefit of machinery over a period of 20 years. The excavations were highly controlled and they are to be lauded for their fine work. A complete issue of the Pennsylvania Archaeologist, (Volume 69(1)) was devoted to his research. The Fishbasket site consisted of a circular stockade approximately 170 feet in diameter. Twelve houses, measuring ten to twenty-eight feet in diameter were mostly found within ten feet of the stockade line. Others seemed to be randomly scattered throughout the village and these may relate to other occupations. Typically, each house contained a shallow basin –shaped fire pit, a large basin-shaped pit and at least one bell-shaped storage pit. There were 29 free standing, post enclosed storage structures. These are represented by shallow stains, three to four feet in diameter, one to four inches deep, flat bottomed with a line of posts around the edges. A cluster of these were associated with the largest house on the site. This structure was 28 feet in diameter and seems to have been built (or re-built) over a previous house that was 20 feet in diameter. Three houses have attached storage structures. Other storage structures include straight walled, cylindrical storage pits averaging over three feet in diameter and about 20 inches deep. The bottoms of these structures were frequently lined with a thick matting of grass. The frequency of these different storage features suggests a dependence on maize agriculture. The site is multi-component, dating from Early Archaic times and also includes an 18th or 19th century cabin. 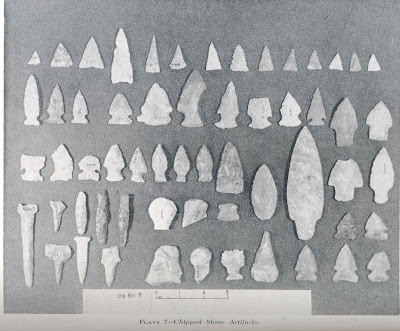 Artifacts recovered from features associated with the village include over 90 triangular arrow points, knives, drills/perforators, bifacial abraders/strike-a-lights, a spokeshave, stone pendants, celts, a netsinker, and a ground stone bead. The pottery was plain or cordmarked with castellations, lugs and strap handle appendages, and decorative appliqués of incising and puntations. 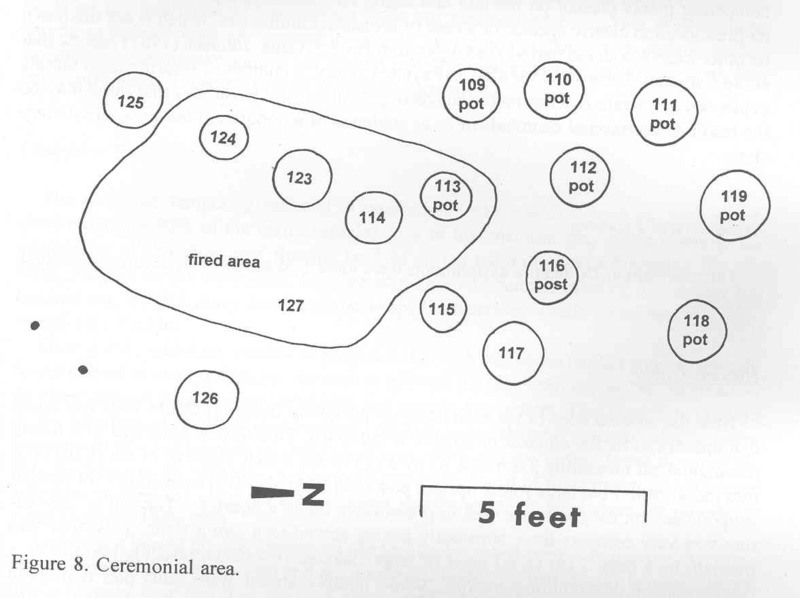 One of the more interesting features of the site was an amorphous burned area located in the center of the plaza. This is associated with 14 shallow basin-shaped pits and a large central post hole 16 inches in diameter. Of the basin shaped pits, seven contain plow damaged pots, six of which were lying on their sides and the mouths were facing the central post. Each of the pots was of a similar size, limestone tempered but representing a “different stylistic and decorative motif”. The meaning of this is not clear but Ken Burkett identifies this as a ceremonial area and that evaluation certainly seems warranted. The Fishbasket North site located across the Redbank creek was slightly larger but otherwise very similar to the Fishbasket site in the shape of the houses, pottery types and with a central ceremonial area. Based on four radiometric dates, this site dates to 1055 AD. 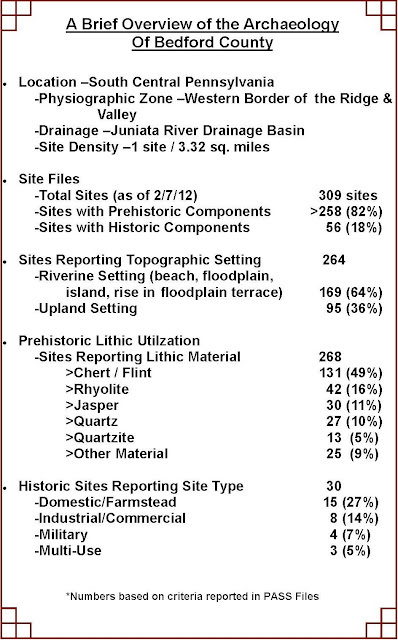 Both sites are similar to the Kimmel Mine sites (36Ar121 and 36Ar221) in terms of pottery and feature types. Further to the south, early Monongahela sites share pottery characteristics and village community patterning. Clearly they are related to this regional manifestation but there also seems to be other similarities to pottery of the West Branch of the Susquehanna River. Ken Burkett notes that all four sites are located adjacent to major fords in the river and along recorded Indian paths. 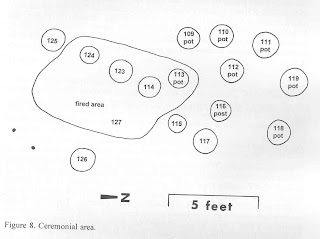 Based on a very distinctive ground stone bead, Ken believes these sites were located along Frankstown/Vanango path, and he links the Fishbasket site to sites in Southcentral Pennsylvania. The above summary is presented as another example of Late Woodland village types and Late Woodland adaptations in the Commonwealth. It is interesting that people were living in villages and dependant on maize agriculture in the Middle Allegheny valley before a similar adaptation appeared in the Susquehanna and Delaware valleys. 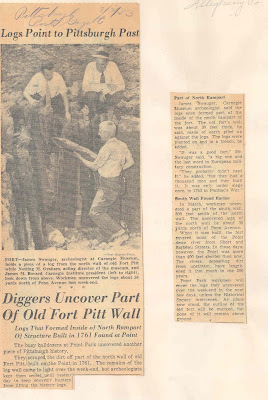 We hope you’ve enjoyed this glimpse into the archaeology of Armstrong County and that it inspires you to learn more about the archaeology of your county. These resources are Pennsylvania’s heritage and for all of us it is our window into the past. Please help us preservethese important resources by reporting and recording your archaeological finds while we all Preserve our Past for the Future. 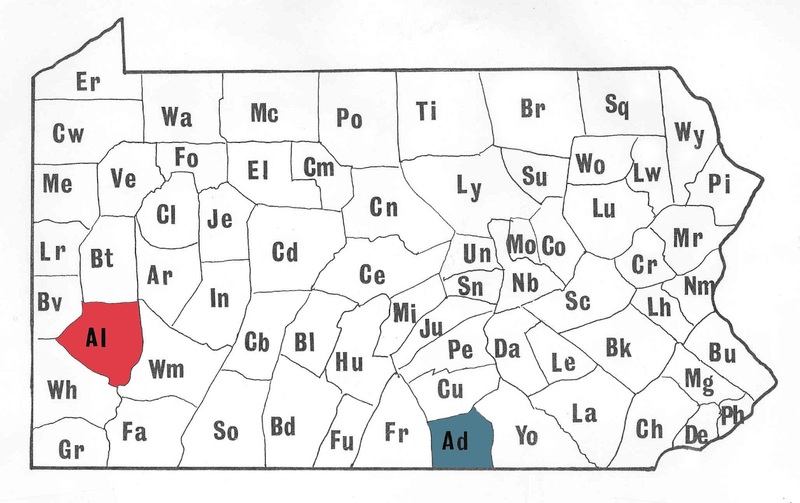 This week we travel across the state to southwestern Pennsylvania to Allegheny County. This heavily populated county is home to Pittsburgh and all that great city has to offer- Heinz History Center, Fort Pitt Museum, Carnegie Museum, Point State Park and oh yeah, the Pittsburgh Steelers. Despite construction and development in this metropolitan area, there are 625 archaeological sites recorded. These sites range from the Paleoindian period to 20th century farmsteads, each of them with a unique piece of our heritage. Allegheny County was an important location during the French & Indian War, situated strategically at the forks of the Ohio River this location was sought as a supply route by both the French and British troops. French troops needed the connection to allow for supplies from the northern territories to come down French Creek into the Allegheny River to transport goods to French controlled lands in the Louisiana Territory. British troops sought control of this territory to allow for western expansion and control of the fur trade. It comes then as no surprise that seven military sites are located in Allegheny County, including Fort Pitt. Built by the British after the French were forced from Ft. Duquesne, this was the largest fort of the period and served as a stronghold in securing the Ohio Valley. Excavations conducted during the 1940’s and 1950’s at this important site produced timbers from the stockade walls surrounding the fort. Newspaper accounts of these excavations stirred public interest and enthusiasm for the preservation and reconstruction of the fort property. 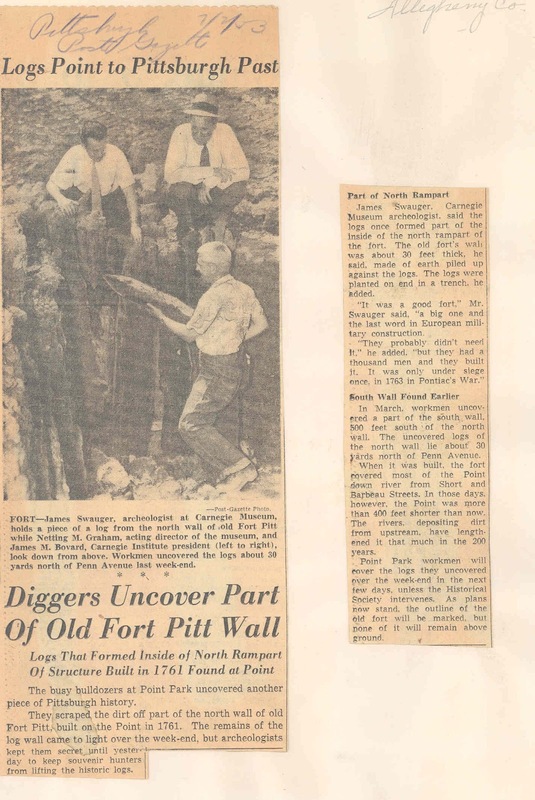 Newspaper accounts of excavations during the 1940's at Fort Pitt. Native peoples occupied this location long before it was sought by the French and British and roughly sixty-two percent of the sites recorded in the site survey files are from prehistoric sites. One of these sites, Wexford (36Al187) was discovered during an archaeological investigation prior to new construction. Testing and subsequent excavations by Christine Davis Consultants produced carbonized botanicals including seeds, pits and wood fibers. Charcoal recovered was analyzed as white oak as a result of a single-burn episode. Careful excavation of features at Wexford site produced botanical remains for analysis. ﻿ The recovery of botanicals is important as archaeologists continue to analyze food consumption and changes in flora and fauna. Diagnostic materials from this site indicate repeated occupation and use of the area from the Late Archaic period through the Middle Woodland period and up to the early Late Woodland. The excavations revealed multiple hearth features with one described as a “very dense roasting pit”. Radiocarbon dating of charcoal from this feature produced a date of 2000+/-60 BP attributed to the Middle Woodland period. A nutting stone exhibits use by Native peoples in processing nuts. ﻿ Recent excavations by GAI Consultants for the construction of the North Shore Connector Tunnel provided yet another window into the past for Pittsburgh residents. Urban settings often produce wells and privies which provide archaeologists with an opportunity to analyze the contents of a household, often sealed in time. These bottles and dishes are the basis for research in consumerism and play an important part in understanding a number of questions posed by archaeologists and anthropologists. Researchers are able to look at factors in consumerism such as ethnicity, gender, availability of products, age of households, and the list goes on. Bottle recovered from North Shore project- hands joined in union. Excavation area preserved underneath paved surfaces of the urban surrounding. We hope you’ve enjoyed this glimpse into the archaeology of Allegheny County and hope that it inspires you to learn more about the archaeology of your county. These resources are Pennsylvania’s heritage and for all of us it is our window into the past. Please help us in preserving these important resources by reporting and recording your archaeological finds while we all Preserve our Past for the Future.